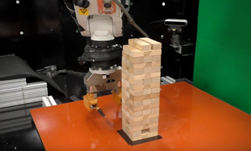 A team of researchers from MIT just built a robot and developed a deep learning-based system that can play Jenga, a game in which players take turns removing blocks and placing them on the top of the structure to make it taller and more unstable. The robot uses a soft gripper and a computer vision system to strategically pull and place the blocks. Details of the Jenga-playing system were recently published in the Science Robotics journal. What makes the work unique is that Jenga is a complex game that requires physical interaction for effective gameplay. The system developed by the team can infer block behavior patterns and states as it plays the game. The approach has the potential to help robots assemble electronic devices such as smartphones and other small parts in a manufacturing line. 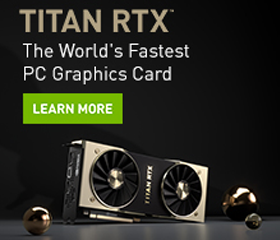 Using a standard robotic arm, an RGB camera, and two NVIDIA TITAN X GPUs with the cuDNN-accelerated PyTorch deep learning framework, the team set up a Jenga tower within the robot’s reach and taught it to play the game. “Rather than carry out tens of thousands of such attempts (which would involve reconstructing the tower almost as many times), the robot trained on just about 300, with attempts of similar measurements and outcomes grouped in clusters representing certain block behaviors,” the MIT team wrote in a blog post. For the visual perception system, the team used the Mark-R-CNN system pretrained on Res-Net-50. For future projects, the researchers are interested in transferring the robot’s newly learned skills to other applications.